As of early August 2016, Google made some mortifying changes to their Keyword Planner that would disturb SEOs around the world. Adwords users like you and I were hit with limited keyword data showing volume ranges instead of the exact search volumes we took for granted. What good do search volumes like this do? There are obviously a lot of numbers in between, and it would have been equally fruitful just to kill the tool altogether. Not only has this affected SEOs, but it’s also hit millions of casual bloggers who rely on keyword search volumes to create their content. Accounts that send too many keyword requests. Google’s recommendation is to use an alternative solution called Forecasting. Haven’t heard of Google’s forecasting tool? It’s because it’s just as useless as their broad range of search volumes. If you want to waste 3 minutes of your day, give it a shot, and you’ll get results like this. Michael Harrington, a Money Journal subscriber, raised a great point in my keyword competition video. The obvious solution seems to be to spend more money on Adwords campaigns. But how much is enough? And is it a viable solution for new bloggers just starting out? Or what about advertisers who are already having success with Facebook or Pinterest Advertising? But these are more than just keyword tools. They have a wealth of data you can use for link building, on-page SEO, and hunting down long-tail keyword phrases. For most of us casual bloggers, we just want keyword planner back in its original form. So today, I’m going to show you a simple workaround to fix the useless search volume ranges and get back on track with data you can rely on. The secret lies in your account type. You probably created your account by going to adwords.google.com. We all did. Manager accounts are designed for advertisers and agencies managing multiple Adwords accounts. For whatever reason, Google hasn’t rolled out their changes to these accounts. The first step is to create your Google Adwords Manager Account. After you’ve created your manager account, you’ll need to login to your current Adwords account and copy your Customer ID number. The customer ID number will be used to link your personal/business account with your manager account. You can do this by selecting the “Link existing accounts” from the drop-down menu. 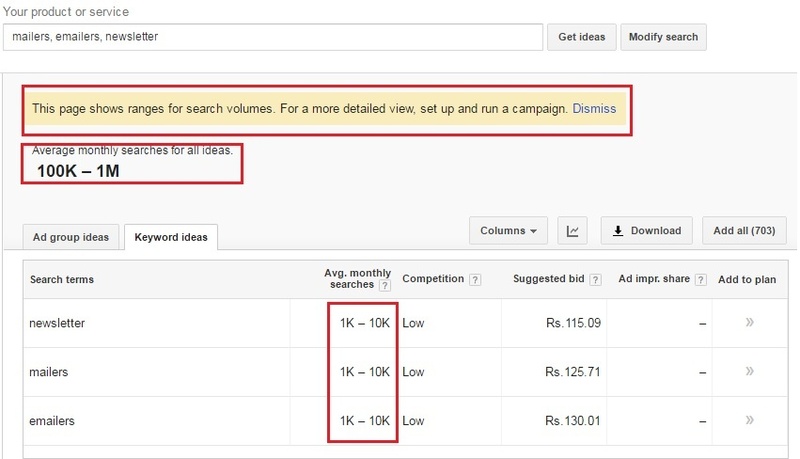 Finally, copy and paste your Adwords customer IDs in the text area provided. From here, you just need to accept the request, and you’re all set to go. Keyword Planner isn’t available in your manager account. 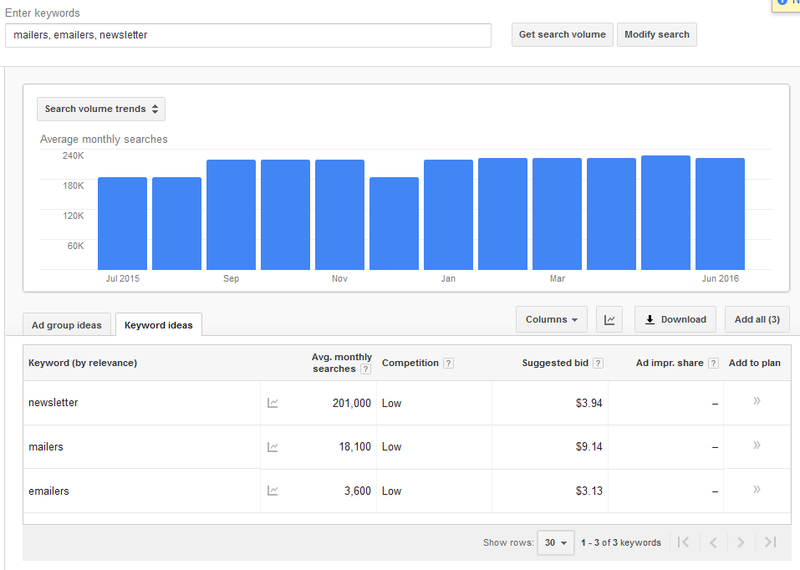 Your account is ready to go, and you can start looking at Google’s search volume data now without the arbitrary ranges. But you might have noticed that the “Tools” menu that houses the Keyword Planner is missing. Remember that this is an Adwords Manager account. The intent for these users is to oversee multiple Adwords accounts. As a result, you’ll need to go to one of your linked accounts to access the old Keyword Tool data. You can do this simply by clicking on one of your Adwords account nicknames from the “Accounts” manager. A new window will open where you can click on the “Tools” menu and then keyword planner. From here, you’ve got old Sally back up and running. It’s just a matter of throwing in a keyword phrase and waiting for the search volumes to repopulate. Does this volume fix work for third party software? There’s a good chance that you’ve purchased another keyword tool at some point. Last year, I reviewed Market Samurai with over 1.5 hours of video. I thought it was only fair to put them to the test. Since a lot of keyword research tools require you to authenticate your Adwords account, logically, they should work, right? And it does for Market Samurai. In fact, processing bulk keywords were significantly faster than it ever has been. I also have Long Tail Platinum in my software kit and decided to give it a spin. Strangely, they are still providing keyword data by range despite having a manager’s account. Perhaps it’s because of the recent changes made at Long Tail Pro and the announcement of a major fix in the works. If you’re using another tool that requires Adwords authentication, it may be worth contacting them and sharing this workaround with them. It’s no doubt that Google dropped a big bomb on us. But can we complain? They own the Keyword Planner and gave us proprietary data for free. Unfortunately, it was being abused by scrapers and bots slowing down the system for everyone. This fix works as of the date of publishing, and if Google is adamant about keeping these changes, manager accounts will also fall into the “low spending” or “API throttling” category too. After a month without keyword search volumes, I was quickly reminded that Keyword data shouldn’t be a be-all-end-all research method. It’s just a good validator that there is factual data to support the demand of user intent. The days of 2011 are gone when keyword targeting was at the forefront of every marketer’s message. With 2017 quickly approaching, we are in a place where our paradigm needs to shift to audience research with the user’s needs first. Try tactics like the one below combined with keyword data and you’ll be unstoppable. Let me know in the comments if setting up a manager account works out for you. Great article! I’ve tried this with three accounts under a manager account and wasnt successful. I’m going to try it again with completely new accounts and a different IP to see if Google is somehow watching my IP..
I’m curious too if you had spent money in the past on the account you got working? and the keyword research is also cloud based on their end making it faster. I am using this Chrome extension to get bulk search volumes and CPC values as a workaround. Its free and works well though it is an extra step. Thanks for all you awesome content Sam! Thanks Michael. Looks like you’ve done some serious research on this! One of the accounts had previously had ad spend (no more than lifetime $50). Another account was brand new and had zero ad spend. It had only been logged in once to create the account. The account with some historical spend had issues with the range volumes beforehand. I’ve heard some people creating “dummy” campaigns. You can try creating a new campaign and pause it to see if it works. Or try experimenting with low bids ($0.01). Let me know how your experiments go. Here is the update. I created two accounts – one as the adword account to be managed and an adword manager account. I used different IPs for both accounts. I’m either not doing something right or Google is on to people and locked it down. I’m curious if you find the same results doing something similar or if any of your readers has tried this with fresh accounts and gotten no where. My next experiment is to create a dummy campaign. I’ll let you know where it goes. Thanks for the update. Keyword data is still working for myself. @Sam Oh Got this link in an email from LTP. If you scroll to the most recent comment it looks like others are reporting that Google has plugged this hole. When you tried using the MCC account, did you click through the accounts page, then go to tools to try the keyword planner? I noticed that when trying to directly access GKP through my Adwords account, the “volume ranges” still show. I hope this is the issue and you can save time from an endless search and proxies to get it up and running. @Sam Oh – I did click through the accounts page and then to the KW planner. I’ve attached two screen caps. One is for an account that had no prior adwords link (1) and the other is for a well established account that I ran a campaign from a long time ago (2). No joy as you can see. Did you click the account administrator switch on when linking the accounts? It did not seem to work either way for me. When I get some time, I’m going to VPN and create accounts from completely different IPs to see if Google isn’t watching the IP coming in to lock the KW planner down. Hm. That’s strange. I did exactly as outlined in the post. I know you provide KW research as a service, so perhaps it’s because of the latter ban – throttling. Keep me posted. Agreed with Michael Harrington that Google shut down this workaround. Seems to be more common that people aren’t getting it to work. For whatever reason, both of my accounts are going. I’ll make sure to update this post if a new workaround comes to my attention. Thanks for sharing Eagan. It works on one of my accounts, but not the other two. It’s tough to predict exactly what they’re doing. Sorry it didn’t work out for you. I’m using the “Keywords Everywhere” chrome extension – it adds an extra column in adwords with the monthly volume. I’m assuming they have a paid account that they scrape the data from. We can create MCC account or simply use other keyword tools. So I went through this and when I click through to the linked account it now goes to adwords express and not the regular adwords so I can’t use the keyword planner? Do you know how this can be fixed? They may have put a stop to the workaround. please help me for this solution. I realize this is an older article but was wondering if there are any updates on this front? Are we just out of luck if we don’t spend money? To be honest, pretty much. My Adwords account hasn’t been blocked, but I rarely use GKP. My favorite keyword research tool of choice is Ahrefs.com. Well worth the money.